Publicity about bedsharing with an infant often raises concerns and warns parents against it. New mothers are left wondering what to do as babies have a biological need to feed during the night and mothers are hardwired to respond. Breastfeeding releases hormones which aid rest and relaxation in the nursing dyad and make mother and baby sleepy. If warnings about bedsharing lead mothers to stop taking their babies into bed with them, they will still need to feed their babies somewhere. This will probably be in a chair or on a sofa, which are riskier places to fall asleep with a baby than in a bed where appropriate measures have been taken. When a baby dies suddenly and no other cause of death can be found, it is considered a SIDS death. The four biggest issues associated with SIDS are smoking,[i] laying a baby facedown for sleep,[ii] leaving a baby unattended[iii] and formula feeding. [iv] It happens in a small group of vulnerable babies who have very specific but undiagnosed health issues. Babies may become distressed if their need to be close to their mothers at night is denied and a vulnerable baby may also be more sensitive to stress. SIDS is different to the risk of Accidental Suffocation and Strangulation in Bed (ASSB) which happens when a baby is in an unsafe sleep environment with an impaired carer. The lowest SIDS rates in the world are in countries where bedsharing is traditional, for instance parts of Asia and South Asia. [v] It doesn’t seem to be a matter of geography, as when people from low-risk cultures move to other countries and bring their traditions with them they also tend to bring a low rate of SIDS. [vi] The US has a higher rate of SIDS than just about anywhere else, given the prevalence of the four big risk factors mentioned above. Bedsharing is not one of them. Premature babies are more vulnerable than full-term babies as they are not yet developed enough to regulate their own bodies, and can be more at risk of SIDS. [vii] However, hospitals are increasingly encompassing “Kangaroo Care” where a mother gets comfortable leaning back and holds her baby skin-to-skin under a blanket. Her body temperature, heartbeat and voice help regulate the baby’s own breathing and a healthy sleep. Kangaroo Mother Care can continue at home and some mothers like to keep their baby secure against them using a special wrapping technique. This can be used at night to keep a baby safe but it’s important to be informed about this to ensure it is being done safely. There is no research on the right time to start ordinary bedsharing with an older premature or fragile baby, as each baby will be ready at a different time. There will probably come a time when a mother can see her baby is ready. 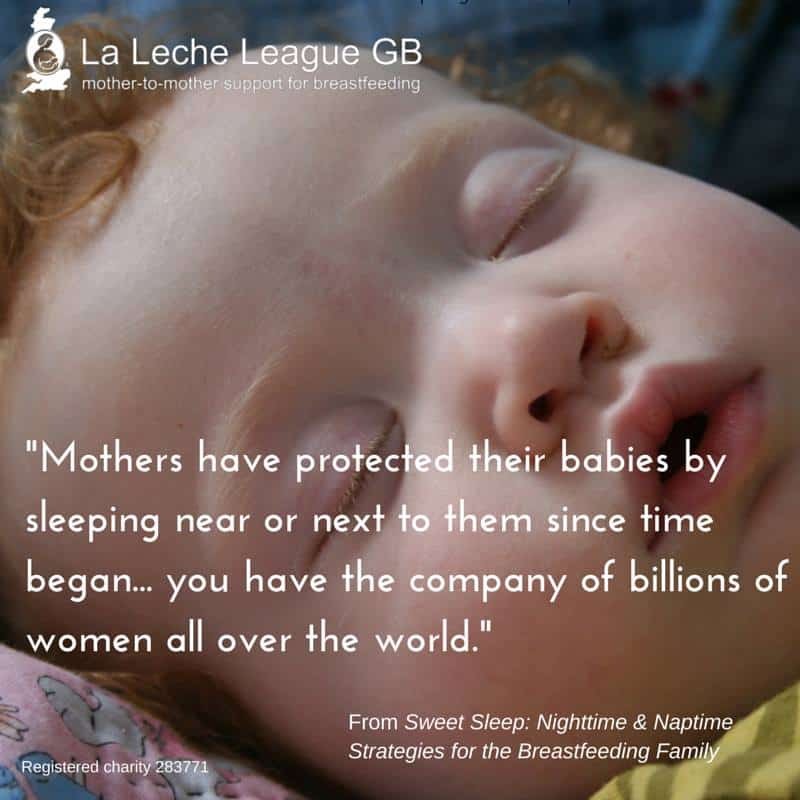 Breastfeeding mothers and babies sharing sleep is a biologically normal behaviour, while formula feeding and separate sleep are departures from the norm. It is these behaviours that need to be shown to be effective and safe, not the other way round. In some reports on SIDS and other sleep related deaths, breastfeeding mothers who do not smoke and have not consumed alcohol or arousal-altering medications are considered a sub-group to be discounted from the analysis,[viii] whereas they should be the normal starting point. A first step in looking at infant deaths in adult beds would be to look at what was wrong with the beds, not what was wrong with the mothers. Sofas and chairs represent a much greater risk than safe bedsharing. In various studies on SIDS there has been no consistency in the data collected, so there are missing variables which can make a significant difference to the results. One question which has sometimes been omitted is “how was the baby fed?”, and this makes a big difference when talking about breastfeeding and bedsharing as opposed to formula feeding and bedsharing. For example, in 2010 there was a campaign in Milwaukee County against bedsharing. [xi] When the statistics were investigated it was found that all the “bedsharing” deaths in the past year had involved adult alcohol use, a baby on a pillow, difficult living conditions and/or smoking. Every death involved a formula fed baby. Gathering information at a death scene is complicated and research conclusions are only as good as the data collected. In some places infant deaths are investigated by a doctor with specialised training; other places don’t require any special training. Some places have a death scene report form, but it isn’t used everywhere and bedsharing is not always clearly defined. Some examiners record how the baby was fed, others don’t. Some ask about smoking and some don’t. Sometimes information given by the adults involved isn’t accurate. An often-cited 2009 study [xiii] did not collect data on alcohol consumption, as previous experience had demonstrated the difficulty of obtaining accurate information, thus ignoring a key variable for both SIDS and suffocation. This huge range of approaches, definitions, levels of accuracy, detail and training provide the data for the “never bedshare” studies. When committees and support organisations include parents who have lost a baby to SIDS, it is understandable that strong emotions will be involved. Four researchers who use very clear definitions in their studies are Drs. Helen Ball (UK), Nils Bergman (South Africa), Kathleen Kendall-Tackett and James McKenna (USA). Their conclusions support the safety and normalcy of bedsharing. Dr. McKenna says that the amount of CO² the mother expires in her breath acts to stimulate infant breathing. Expelled CO² appears to act as a potential back-up, should the baby’s own internal drive to breathe falter or slow, since the baby’s nasal regions can both detect and respond to the presence of this gas by breathing faster. In fact, no one has proposed a physiological mechanism that would cause a baby to die of SIDS just because he is next to his non-smoking mother, and since mothers and babies are hardwired to be together it wouldn’t make any sense. Losing a baby is such an incredible tragedy that it is understandable to look for ways to prevent this. However, suggestions have to be “doable”. Most breastfeeding mothers sleep with their babies at least some of the time and it is unrealistic to try to stop this. Creating one rule for a specific high-risk situation and applying it to everyone will not work. Tired mothers have to feed their babies somewhere and making everyone feel they are at risk can cause damage in other ways. Mothers may turn to formula or cereal in the hope of getting their baby to sleep longer; they may fall asleep in unsafe places or undertake a sleep-training programme which has associated risks. While SIDS is something which affects a small group of vulnerable babies, parents need to be aware of ASSB (breathing hazard) risks. Making sure a bed is as safe as possible, free of suffocation and injury risks, having a smoke free home, not using arousal- altering medications or alcohol, and breastfeeding are all ways to ensure a healthy baby and his family get a good night’s sleep. Even if a mother does not intend to bedshare, ensuring her sleeping area is safe will help on those nights when she finds herself nursing in bed and falling asleep. Policies designed to protect the health of a few babies may result in harm if applied to all. The blanket recommendation that parents “simply avoid bed-sharing” may well scare women into making decisions which are not right for them, their family or their baby, and could lead to babies being breastfed in places where it would be riskier for women to fall asleep. Ultimately, it could also lead to women stopping breastfeeding because they are too worried about where to feed. Safe Sleep campaigns which tell mothers their baby should not sleep in their bed, a couch or a chair, give that mother no information about where she can feed her baby at night when she is likely to fall asleep. Mothers need to have a clear explanation of SIDS and ASSB risks, with different recommendations based on their different lives. They need full information about their options, not alarmist threat messages. If this recommendation closes down the opportunity for discussions about safe bedsharing, it denies parents whose babies are at low risk for SIDS (healthy term births, breastfed babies with non-smoking, non alcohol-consuming parents) the opportunity to make an informed decision and may lead to parents feeling they need to lie about their choices. It is vitally important that parents are aware of the need for safe sleeping arrangements and of circumstances which might cause risk. They need to know about the risks and benefits of co-sleeping and unsafe co-sleeping practices so they can make their own informed decisions. Trying to instigate a ban is not a reasonable or effective response to such an instinctive and natural human behaviour. In 2014, a booked entitled Sweet Sleep was published by Pinter and Martin on behalf of La Leche League International. The book was written by four La Leche League Leaders, Diane Wiessinger, Diana West, Linda J. Smith and Teresa Pitman, who have decades of experience in helping mothers breastfeed. They have become highly knowledgeable about the topic of breastfeeding and bedsharing through 3 ½ years of research and reading, discussing and dissecting hundreds of scientific articles on this topic. The Preface for the book was written by Professor Helen Ball, a member of LLLGB’s Panel of Professional Advisors. Following her appointment as a Lecturer in Anthropology at Durham University in 1993, she began a programme of research on night-time infant care, and established the Parent-Infant Sleep Lab in 2000. 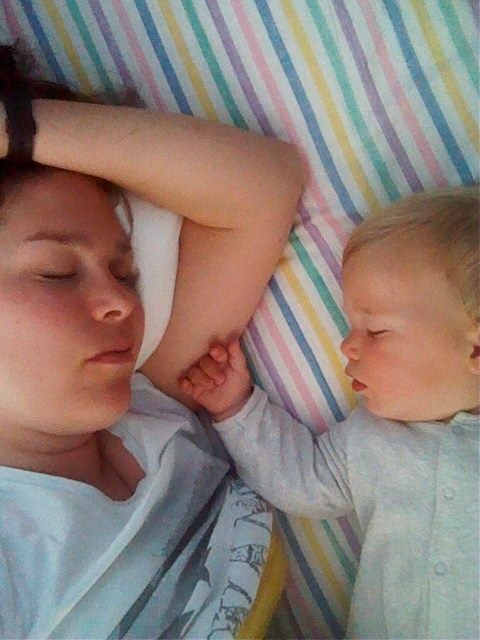 Her research examines sleep ecology, particularly of infants, young children and their parents. 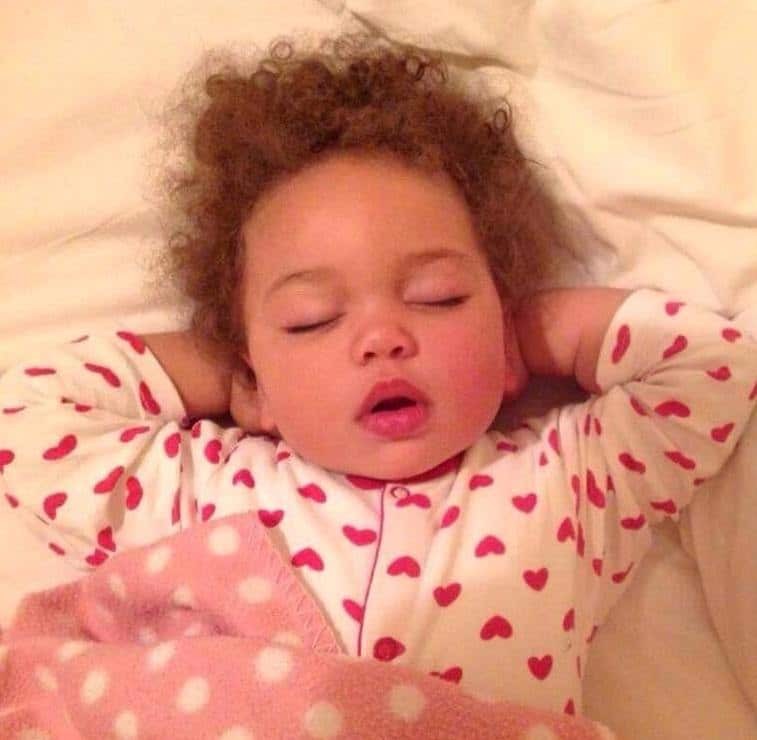 This encompasses attitudes and practices regarding infant sleep, behavioural and physiological monitoring of infants and their parents during sleep, infant sleep development and the discordance between cultural sleep preferences and biological sleep needs. Sweet Sleep extensively covers the subject of shared sleep, looks in detail at the facts surrounding this topic and offers information on how mothers and babies can safety sleep together and the many benefits to this. I am indebted to the book for providing many of the facts in this article. La Leche League is dedicated to providing education, information and mother-to-mother support and encouragement to women who want to breastfeed. Sleeping With Your Baby McKenna, JJ. Washington DC: Platypus Media, 2007. Helping Your Baby to Sleep: Why Gently Techniques Work Best. Gethin, A. & Macgregor, B. Lane Cove AU: Finch, 2011. [i] Zhang K., Wang X.: “Maternal Smoking and increased risk of sudden infant death syndrome: a meta analysis”, Legal Medicine (Tokyo), 2013 (https://www.ncbi.nlm.nih.gov/pubmed/23219585); and Fleming P., Blair P.S. : “Sudden Infant Death Syndrome and parental smoking”, Early Human Development, Volume 83, Issue 11 November 2007 (http://www.sciencedirect.com/science/article/pii/S0378378207001296). [ii] Mitchell E.A. et al. : “Four modifiable and other major risk factors for cot death: the New Zealand Study”, Journal of Paediatrics and Child Health, 1992 (https://www.ncbi.nlm.nih.gov/pubmed/1524879). [v] Liamputtong P.: “Childrearing and Infant Care Issues: A Cross-Cultural Perspective”, Hauppauge, NY: Nova, 2007 (https://www.novapublishers.com/catalog/product_info.php?products_id=5561). [vi] Ball H.L., Moya E., Fairley L. et al Infant care practices related to sudden infant death syndrome in South Asian and White British families in the UK.”, Paediatric and Perinatal Epidemiology, January 2012 (https://www.ncbi.nlm.nih.gov/pubmed/22150702). [ix] Carpenter R. et al. : “Bed sharing when parents do not smoke: is there a risk of SIDS? An individual level analysis of five major case-control studies.”, BMJ Open, May 2013 (http://www.ncbi.nlm.nih.gov/pubmed/23793691). [x] National Institute for Health and Care Excellence: “Addendum to to Clinical Guideline 37, Postnatal Care – Routine postnatal care of women and their babies”, December 2014 (https://www.nice.org.uk/guidance/cg37/evidence/full-guideline-addendum-485782238). [xiii] Tappin D. et al. : “Bedsharing, roomsharing, and sudden infant death syndrome in Scotland: a case-control study.”, Journal of Pediatrics 147, No1, Jul 2009: 32-7 (https://www.ncbi.nlm.nih.gov/pubmed/16027691). [xiv] National Institute for Health and Care Excellence: “Addendum to to Clinical Guideline 37, Postnatal Care – Routine postnatal care of women and their babies”, December 2014 (https://www.nice.org.uk/guidance/cg37/evidence/full-guideline-addendum-485782238). [xvi] National Institute for Health and Care Excellence: “Addendum to to Clinical Guideline 37, Postnatal Care – Routine postnatal care of women and their babies”, December 2014 (https://www.nice.org.uk/guidance/cg37/evidence/full-guideline-addendum-485782238).